Last year I finally bought a 3D printer. In retrospect I should have done this a long time ago. and that anything less was a waste of time. There where toys only capable of churning out useless trinkets. Boy I was wrong. Anybody interested in mechanical engineering or industrial design should get one immediately. I got a Printrbot metal simple kit. My appreciation for 3D technology is colored by my personal experience with this particular machine, that turned out be an amazing piece of equipment. Sturdy, reliable, elegant and honest in its design, the simple metal has performed well beyond my expectations. One of the reasons I was holding back my purchase, was that I was afraid that after a couple of week of tinkering, the machine will be collecting dust on a corner. But to the chagrin of the rest of my family, the Printrbot is constantly churning out parts. Currently, I’m even considering getting a Ultimaker or a Lulzbot Taz, not to replace my Printrbot but to extend my build size and printing capacity. At the same time last year I start evaluating OnShape a cloud based professional CAD solution. I have used Autodesk Fusion 360 on and off for some time, but the chemistry wasn’t there. I do think Fusion is an amazing piece of software and I still use their CAM and rendering features, but modeling on OnShape just “clicked” with me from day one. I’ll do my modeling on OnShape, export the part to STL, slice the part in Simplify3D and sent the G-code to Octoprint. On a side note, before upgrading your hardware get Simplify3D! Having a 3D printer at hand allows you to develop your designs skills at a fast pace. You can iterate over small aspects of your design until you get them right. Say, two parts need a snap-click assembly. You can isolate the snap-click features and print only the relevant sections, until you get the tolerances and amount of material right. Then you add those sections to your main parts. You will learn a lot about designing within the constrains of a production method. In 3D printing, orientation plays a crucial role. Orientation impacts the level of precision you can achieve on a given surface. Because parts consists of layers, the forces they can withstand vary depending on the direction applied. In order to get the ideal orientation for a critical aspect of your design, you will sometimes need to split a part into discrete components. The filament (type of material) and the chosen extrusion settings can have an impact in tolerances. For mechanical parts where you need a higher level of precision, you are better of with slower speeds and low heat. suddenly became an esthetic asset that reinforce the structural ideas behind your design. Holding such a piece in your hand with the original digital model still on-screen is remarkably satisfying. It’s and idea materializing out of thin air, and it feels like magic. If you already have or want to buy a 3D printer, don’t forget that it’s not about the technology, but about what you can imagine. I own a Simple metal, but have I played with, and can recommend the Ultimaker and the Taz. Don’t be cheap on the filament. You are not going to use that much, and quality shows. Recommended brands are Colorfabb & Monsterfil. I start using blue tape (3M ScotchBlue 2090 Painter’s tape from Amazon or from Adafruit ) with mixed results. Printing larger flat surfaces without warping was a challenge, until I start heating the printer bed with a heat gun. Because the bed on the Printrbot is solid metal, it could accumulate enough heat to get me a solid foundation. But applying the tape quickly became annoying. Then I got the Zebra Plate from PRINTinZ! I can not recommend this enough. No preheating, or taping or warping. The only problem is that sometimes parts can be difficult to pray of the board. If you can wait you can put the plate on the freezer for some minutes. One trick for the first layer is to add small pieces of paper under the bed. If the first layer is too squashy you can take them out while the brim is still printing. It not squashy enough you can remove the center clip. This will give you enough wiggle room to compensate for small z calibration issues. – Even if you don’t use Simplify3D check their quality guide. This is a great resource to understand how to improve your prints. Simple UI, to get you started but you’ll be long for more control pretty soon. This entry was posted in Uncategorized on February 23, 2016 by ronaldx. and hope that people had the right media plugin to handle your video format. YouTube changed that by not only hosting and encoding the files, but also by allowing you to embed their viewer into your website. By “playing ball” with the rest of the web YouTube became an integral part of it (cats may have played a role as well). Something similar happened with maps. By allowing third-party websites to embed their maps (and by providing a formal API) Google Maps evolved from a novel web-version of a classical desktop-app to a structural part of the web. Currently I’m intrigued by the future of OnShape, a web & cloud base 3D CAD system. They are openly developing the product at a furious pace (https://www.onshape.com/cad-blog). At this rate they could soon reach feature parity with their nearest competitors. Recently I ran into a relevant scenario. “Enabling the future” is a global network of volunteers that donate 3D print time to create prosthetics for amputees. 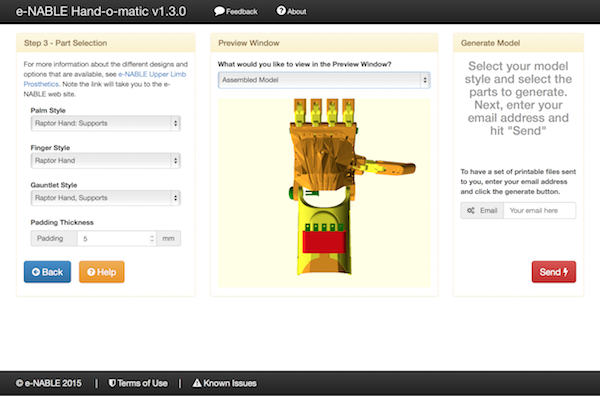 They have created a great web app, the “Hand-o-matic“. The app let you customise the design of a prosthetic hand and will mail you the generated STL documents based on the supplied parameters. They use OpenSCAD (an open source CAD modeller) in command line mode to generate still-images of the parts (and to generate STL files). And embedable CAD system could power a much richer experience for this and many other sites where there is a need for visualising and editing parametric 3D designs. OnShape has the potential to enable a new kind of web application hybrids (Mashups), that take CAD and the Web to new places. This entry was posted in Uncategorized on August 17, 2015 by ronaldx. The update rate of my OLED screen via IC2 is to slow to do proper animation. Redrawing the eyes on a new position every 12 times a seconds was out of the question. Luckily the oled-js library supports a scroll method. So I went with that and implement the movement of the eyes by controlling the scroll direction and timing the start-stop sequence with temporal. Because the entire screen buffer is pushed around by the hardware, the eyes don’t need to be so simplistic as I initially made them. They could as well be a bitmap with a set of mesmerising cat eyes, but for now this will do. This entry was posted in Uncategorized and tagged Arduino, Felix, OLED, Robot on June 18, 2015 by ronaldx. One of the problems of soft robotics is that some tasks required a high a degree of precision. Knowing exactly where your end effector is crucial and being able to control the “stiffness” of the system is a plus when you need accuracy. Today I stumbled upon a paper that has a novel approach to deal deal with this issues. It’s a bioinspired soft manipulator by Dr. Tommaso Ranzani (http://iopscience.iop.org/1748-3190/10/3/035008). The manipulator is consists of small segments of Silicone. Each segment has four chambers. Tree chambers are inflatable, and by controlling their air pressure, you can move the manipulator around. Pumping two at the same time move the manipulator toward the deflated one, pumping all tree, extends the manipulator. There is a 6 DOF sensor in each junction. By modeling the orientation of each junction and the length of the segments they can calculate the position of the tip. So far nothing new. The genius is in the central chamber. This central chamber is filled with granular material (ex. coffee) and by controlling the pressure in this chamber they can controll the stiffness of the system. It’s the same principle behind John Amend’s and Hod Lipson’s universal robotic gripper. This entry was posted in Uncategorized on May 15, 2015 by ronaldx. This animation tool can now control servos using socket.io and Johnny-Five and it’s actually quite fun! But it is far from production ready. I created a repo for the project: https://github.com/Traverso/go-johnny-go and I have already added a bunch of issues https://github.com/Traverso/go-johnny-go/issues. Nothing major, mostly debris from a rushed prof-of-concept coding spree. This entry was posted in Uncategorized on May 6, 2015 by ronaldx. One of the many gems in this project is the Animation library. It allows you to control one or more servos by defining small timed sequences called segments. A segment is basically a timeline. To control the timing of your keyframes you define cue-points. Your keyframes define the position of a target (servo) at a given time. When you recall your sequence the library automagically controls your servos and perform the described animation taking care of timing, interpolation and even easing for you. I want to add some animation sequences to Felix. Teach him a few tricks. But describing the coordinated movements of a set of 8 servos as cue points and rotations is tedious. Instead i start working on a simple animation editor. The idea is that you edit segments while your board is connected so you can drag and position your servos in real time. In that way you can test/play your segments until you get your moves right. The tool will let you combine multiple segments into animations and export an animation as a js file that you can add to your own project. The video below shows my first attempt at an UI using PaperJS to implement the graphing and interaction. This entry was posted in Uncategorized on April 25, 2015 by ronaldx. Added a battery pack to the belly of Felix. He carry the extra weight with quiet resignation. Currently he is learning to turn by controlling it’s step width. This entry was posted in Uncategorized on April 8, 2015 by ronaldx.